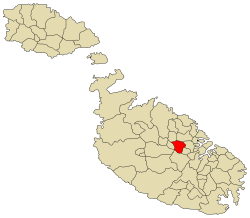 Birkirkara or B'Kara (Italian: Birchircara) is a town in the Central Region of Malta. It is the most populated town on the island, with 22,319 inhabitants as of March 2013. The city consists of four autonomous parishes: St Helen, St Joseph, Our Lady of Mount Carmel and St Mary. It also houses one of the most famous colleges in Malta, St Aloysius' College. Birkirkara is the home town of President Emeritus Edward Fenech Adami and former Opposition Leader Alfred Sant and also the birthplace of the first president of Malta Anthony Mamo. The city's motto is In hoc signo vinces, and its coat of arms is a plain red cross, surmounted by a crown. There are many places of interest in Birkirkara, amongst them the Old Railway Station which is today located within a public garden. Trains were used as means of transportation across the island until the Railway's closure happened in 1931. Other town features include the Wignacourt Aqueduct built in the 17th Century, and St Helen's Basilica, housing Malta's largest church bell. Birkirkara is one of Malta's oldest towns and received mention in the 1436 Ecclesiastical Report mentioning the then existing parishes in Malta and Gozo, from which Birkirkara emerged as the largest parish. Various parishes and suburbs developed out of Birkirkara over the years, including Sliema, St. Julian's, Msida, Ħamrun in the 19th century and Santa Venera in the early 20th century. In more recent years, San Ġwann (1965) and the hamlet of Ta' l-Ibraġ hived off Birkirkara to form part of the new parish and locality of Swieqi in 1993. Birkirkara's main religious feast is that of St Helen which is celebrated on 18 August if it falls on a Sunday, or on the first Sunday after that date. The main event of the celebration is a procession with a large wooden statue carved by the Maltese master-sculptor Salvu Psaila. Notably, this is the only procession (with a titular statue) on the island carried out in the morning. The procession leaves the basilica at exactly 8:00 a.m. and returns to it at 10:45 a.m. The statue is lifted to shoulder-height by a group of townsmen and is carried through the main streets of the town.